For true-color LED spotlight applications below 3W, consider the SN3396, a 3-channel constant current LED driver from the company, which is specifically designed to drive RGB LEDs efficiently from a voltage source greater than the LED voltage. The chip's input voltage range is 6V to 40V and provides an externally adjustable output constant current of up to 350mA. These three channels can be independently controlled by PWM signals with a dimming ratio of up to 1200:1 per channel. 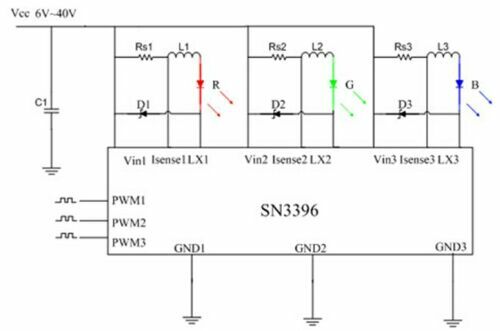 The SN3396 contains a high side output current sense circuit that uses an external resistor to set the nominal average output current. It requires only 3 external components per channel.